FlexEffect Facialbuilding is promoting the Third Edition of its facial exercises program, which features techniques backed by new scientific research. PressRelease Eureka, CA, April 07, 2012 --(PR.com)-- FlexEffect® Facialbuilding®, a facial exercise program designed to alleviate signs of facial aging, is promoting its new Cross Stretching exercises for the face, which are supported by a recent study published in the American Society of Plastic Surgeons' Plastic and Reconstructive Surgery journal. A new addition to FlexEffect's Facialbuilding Third Edition product, Cross Stretching incorporates micro-damaging facial exercises, which release the body's fibroblast cells to foster firmer, younger looking skin. "When I founded Facialbuilding in 1979, all facial exercising was considered risky, and what I developed — resistance training for the face — was considered flat-out insane! Today, the Third Edition of FlexEffect is considered no less shocking. While researching new possibilities for FlexEffect's Third Edition, I was led into developing a new training technique I call Cross Stretching. Again, I expected a firestorm of naysayers, and I was right. I'm excited to finally see a real scientific outpouring on skin stretching and its effects on the body," says Deborah Crowley, a former competitive bodybuilder and author of the FlexEffect Facialbuilding 275-page training book of exercises for the face. The FlexEffect Facialbuilding Third Edition's Cross Stretch facial exercises involve light and fast stretching of the skin in a crisscross pattern across the face, a technique that actually causes mild microscopic damage to the skin. As Crowley wrote in the Facialbuilding book, it is precisely this micro-damaging effect that sets off a chemical-physical response in the body, including the release of important growth factors; overall, this response repairs and strengthens the dermal tissue, resulting in younger skin that is thicker and stronger, with an increased rate of cellular turnover. “The hottest topic in skin research today is ‘Fibroblast.’ Most studies are pointing to these cells as the possible be-all-end-all in tissue rejuvenation. Fibroblast cells found in the connective tissue produce and secrete fibers (collagens, elastic fibers and other substances), especially during wound healing and tissue repair. More accurately, fibroblasts secrete tropoelastin, the soluble, immature form of elastin. Experiments show that even though fibroblast cells are all about wound repair, a cut or puncture produces less fibroblast activity than does stretching the skin. The fibroblasts do not respond to everyday physiological strain on skin but do respond to skin stretched beyond normal levels,” Crowley stated in FlexEffect's Third Edition of exercises for the face. The science behind FlexEffect's facial exercises was confirmed in a recent study by the Tissue Engineering and Wound Healing Laboratory at Brigham and Women’s Hospital, an affiliate of Harvard Medical School; Tufts University School of Medicine; and the University of Padua, among other contributing authors. In the study, researchers noted that the "accumulation of neuropeptides in both epidermis and dermis were significantly increased after cyclical stretching of skin." In layman's terms, the research concluded that by stretching the skin, cellular physiology is affected in a positive way, Crowley explains. Following the smallest amount of tissue damage, which is not visible to the naked eye, the body’s natural healing process takes over, a reaction triggered by FlexEffect's Cross Stretching technique. As it heals, the body creates new collagen and elastin fibers, accompanied by a build-up of glycosaminoglycans (molecules that restore the skin’s moisture capacity); the result, Crowley notes, is firmer, more elastic skin with fewer facial wrinkles. To learn more about FlexEffect or order the Facialbuilding Third Edition visit http://www.FlexEffect.com or call 800-879-9845. Facial exercise pioneer Deborah Crowley has promoted the benefits of exercising facial muscles to improve the appearance of lines and prevent sagging skin for more than three decades. What led Deborah Crowley to passionately pursue a form of facial training in a time that most medical professionals consider such training as damaging, or a hoax at best? Deborah explains, "In my late 20's I began to see some signs of facial aging. Fine lines were appearing around my eyes, and my skin was beginning to lose its childlike firmness. As a dance performer and choreographer my looks were extremely important to me. Having already heard of facial exercises I began my explorations by doing facial isometric exercises. Impressed as I was with the results of my training, I would soon learn under the right circumstances 'toning' exercises are not enough, not nearly enough". A few years later, Deb became interested in weight training and subsequently stepped into competitive bodybuilding. Due to the rigorous training and heavy dieting that comes with being a competitive bodybuilder her training began to have an aging effect on her face. "Although I liked the look of my body, my face had become extremely gaunt - not a good trade off". Instinctively knowing what it would take to fill out her face, she developed what is know today as the most aggressive form of facial training - Facialbuilding. "I converted every isometric exercise I was doing into resistance training". After several weeks of 'facial' resistance training, Deb realized she had it the jackpot. "The firmness of my face was astonishing, my face proved every bit as responsive to resistance training as the rest of my body." Deb released the first edition of her Facialbuilding program, 'FlexEffect ' in 1979. In 2010 she introduced FlexEffect Facialbuilding 3rd Edition, which she claims, "blows the doors off previous editions." Deb, and thousands of FlexEffect clients worldwide, have found that as the facial muscles increase in density, cheeks are lifted, lines and wrinkles diminish and the face becomes noticeably firmer. Even with the success of her original and 2nd edition program she was not content to end it there. When Deborah reached the age of 60, most new acquaintances still guessed her to be in her 40s, but Deb was noticing some subtle facial changes she was not happy with. Extensive investigation led her to believe bone atrophy was the cause. She then developed Jolting and Pressure Reps for the remodeling of facial bone (increasing the bones density), and Cross Stretching to promote collagen and increase elasticity. The 2010 3rd edition of FlexEffect Facialbuilding includes these two completely new and innovative anti-aging techniques. Right after the release of Deb's 3rd edition, research, including a study carried out at the Baylor College of Medicine in Houston, correlates with Deb's finding. 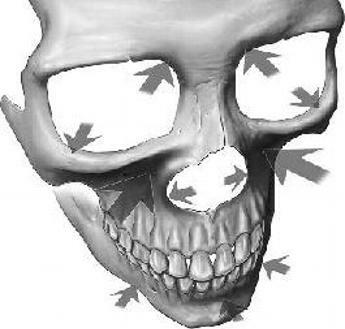 These recent studies have shown beyond doubt that bone atrophy contributes significantly to facial aging, and that gravity and repetition of facial expressions are not such important factors in the aging process and more importantly, facial exercise just might be a way to slow down the bone loss. Deborah affirms the researcher's discoveries do not surprise her in the least. However, she is delighted that the results of the studies might lead to many more people who are concerned about facial aging find the solution to their problem is nothing more complicated than Facialbuilding for 15 minutes a day. "I am proud to say that Flexeffect is the first facial training program that addresses the need for bone remodeling exercises, and we are the first to offer it," declares Deb.